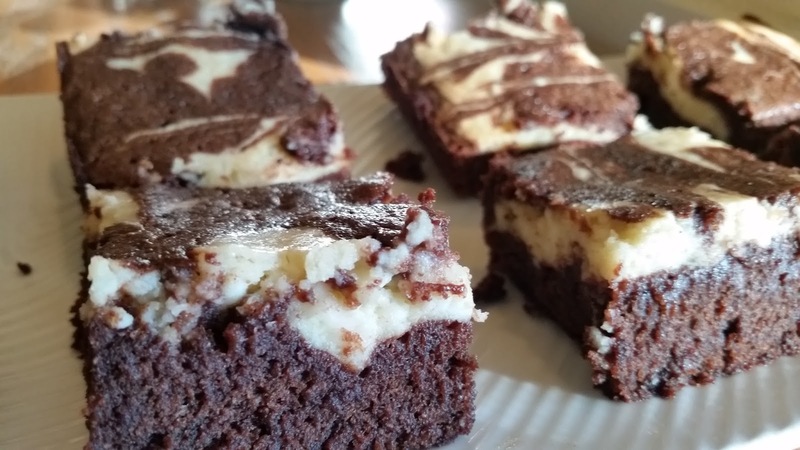 February 10 was National Cream Cheese Brownie Day (who knew???) so we played along and created this yummy recipe. This brownie also worked well with our Chocolate Covered Wednesday, which we celebrate every Wednesday at Lookout Point Lakeside Inn. Preheat oven to 350 degrees. Spray a 9×13 pan with non-stick spray. Cream sugar, cocoa, butter and salt together. Add the eggs, one at a time. Add in the remaining brownie ingredients, mix thoroughly. Pour the brownie mixture into the pan, setting aside 1/2 cup of batter for later use. Beat the cream cheese filling ingredients together until smooth and creamy. Pour on top of the brownie mixture. Place lines of the remaining brownie batter across the short side of the pan, on top of the cream cheese mixture. Use a toothpick or edge of spatula to draw lines through the cream cheese/brownie lines, creating a design. Bake 35-40 minutes, until tester comes out clean. This entry was posted in Desserts, Lookout Point Lakeside Inn by admin. Bookmark the permalink.